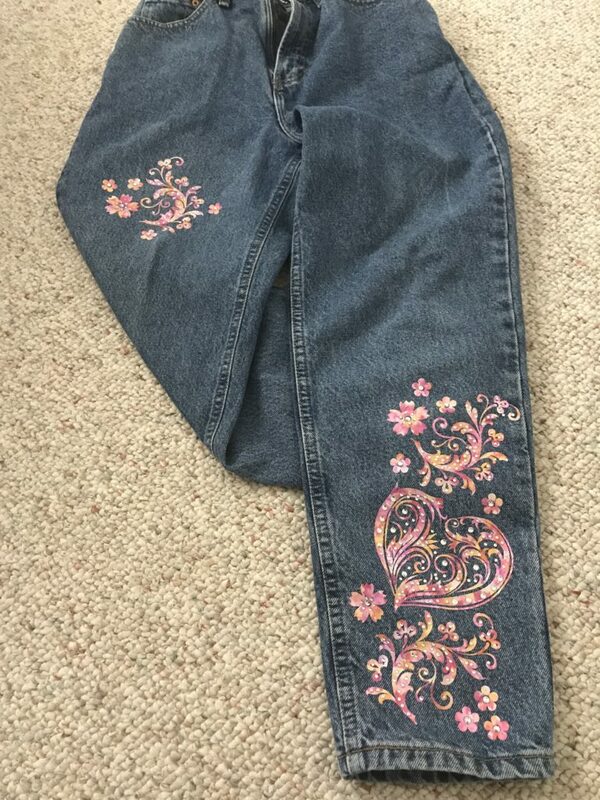 Recently I added some HTV (Heat Transfer Vinyl) and rhinestones to a pair of jeans for a fun and sassy look! 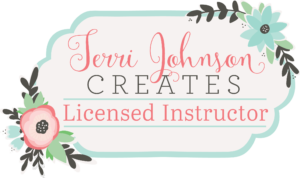 Working in my Silhouette Studio software, I used several elements to create the overall design. I selected flourishes, a heart and some flowers. 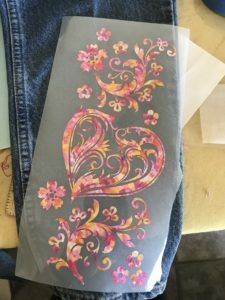 If you look closely you will see that i created one group of flourishes and flowers and used it at the top and bottom of the overall design. I mirrored one horizontally and vertically so they would not appear to be the same. Then I added more flower elements. 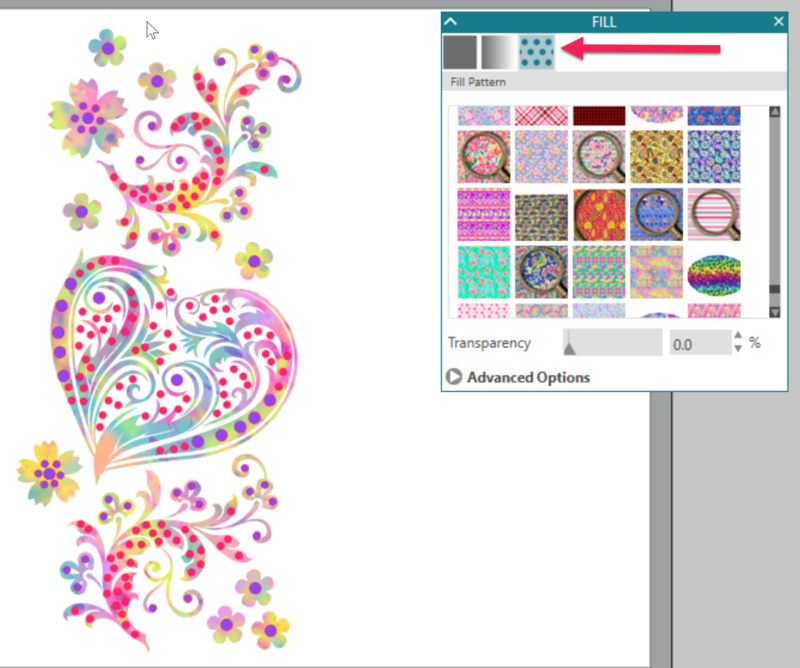 Still working in my Silhouette Studio, I used a Pattern Fill to fill the vinyl part of the design so I could preview how the design would look when cut. 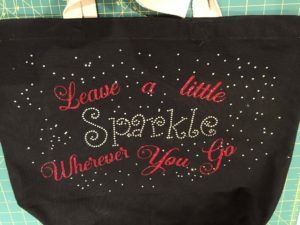 I also added rhinestones to the design using the rhinestone tools in my software. 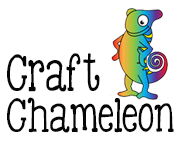 Once I had the design created, I cut the design on my Silhouette Cameo, using Sparkleberry Ink’s Sunset Washed printed HTV. 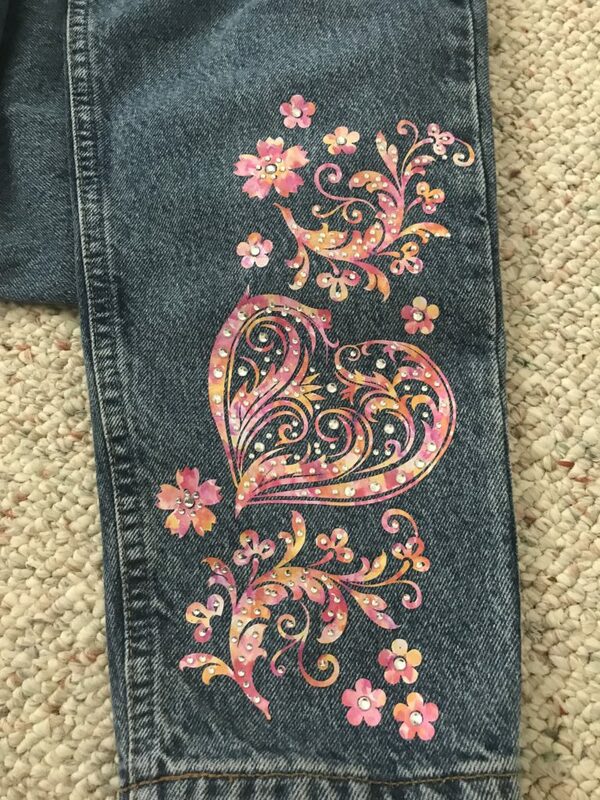 After weeding the design, I auditioned it on the pants. 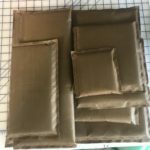 To press the vinyl on the pants, I wanted to use my heat press but was concerned about the seams in the jeans, so I used a press pillow inserted in the leg. Love it Libby! I really want to do this! Have you worn and washed these yet? And did the HTV hold up ok? Jamie, when my husband washes my things with HTV, he always turns them inside out. These have been washed that same way. He also puts them in the dryer and the vinyl and the stones have held up just fine.